The 28.96 metre motor yacht In Full Bloom, listed for sale by Westport Yacht Sales, has been sold with Kent Chamberlain at Chamberlain Yachts introducing the buyer. Built in GRP by US yard Heisley to a design by Juan Carlos Espinosa, InFull Bloom was delivered in 1999 as a Premier 95 model and refitted in 2013. An interior in tiger maple wood, also by Juan Carlos Espinosa, sleeps six guests in three cabins consisting of a master suite, VIP suite and a double, all with entertainment centres, Sharp LCD television screens and en-suite bathroom facilities. There is also accommodation for a captain and two crew in two cabins. The main deck has large tinted windows offering panoramic views and comes with a large L-shaped settee to port facing two barrel chairs and an entertainment centre including a 42-inch plasma television screen on a rise and fall mechanism, while forward is a dining area with seating for six guests. The sky lounge is another haven for relaxation, featuring two settees, an inlaid custom coffee table, two armchairs, a wet bar and a drop-down Sony television screen. On the upper aft deck, al fresco entertainment and dining is available on upholstered wrap-around bench seating for nine guests, a teak table and a 28-inch Sharp television screen. 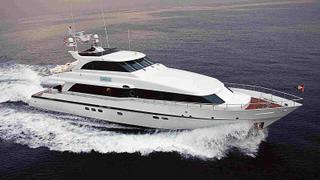 Twin 1,000hp MTU engines give her a cruising speed of 17 knots, topping out at 20 knots. In Full Bloom was asking $1,900,000 and is renamed Marbella III.